As a Virgo, goal-setting is a passion of mine. This means New Years is a particularly fond part of my schedule. 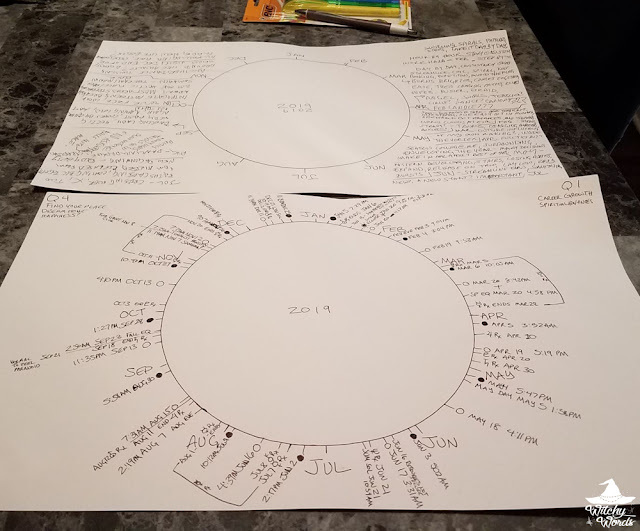 In years past, I have used worksheets, calculations, goal-creating apps, and more to create a chart of goals I feel I need to complete to feel happy with those areas in my life. 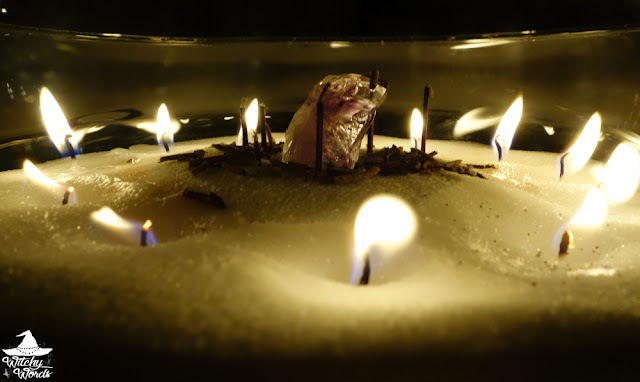 Last year, I turned that process on its head by doing an impromptu spirit work ritual. Because it was so accurate, I decided to repeat that ritual this year! When I performed this ritual last year, it was incredibly improvised, right down to the hotdog buns used as offerings. This year, I had a chance to prepare! 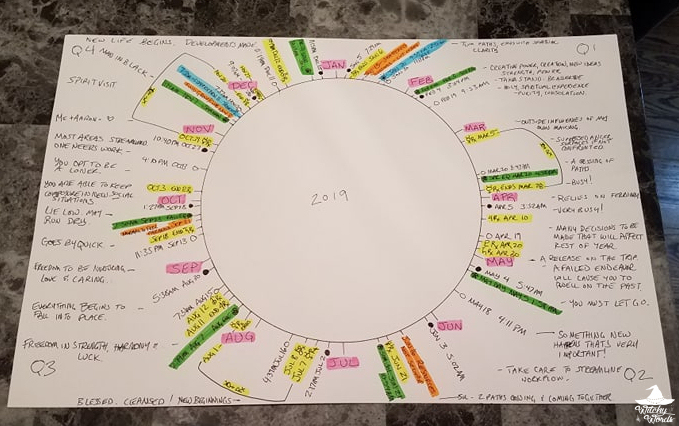 I began by sorting out what 2019 would look like astrologically. This gave me a full perspective of how outside energies could affect me. 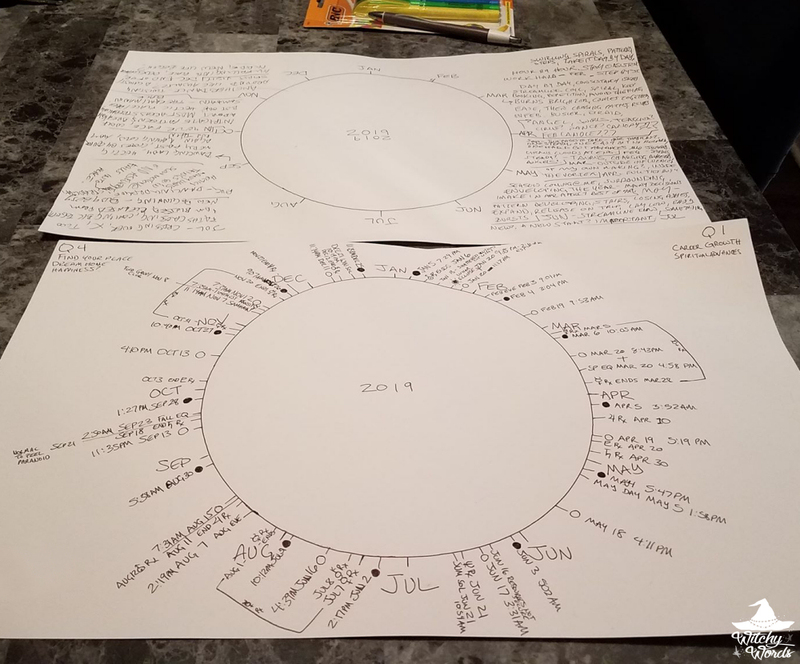 I began by drawing a large circle on card stock, designating where each month landed on that circle similar to a clock, and then noting the astrological and astronomical events of interest all the way around the wheel. I then laid a blank sheet on top of that, labeling each month in equal spacing around the paper with plenty of blank margins for writing. I then placed a bowl with salt on top. In the bowl, I placed twelve buffalo nickels in equal distance around the outer area of the bowl. This is thought to bring luck to the year. I then placed twelve white candles on top - one for each month. I took care to trim the wicks as needed to ensure the burned evenly. Finally, an amethyst stone stood in the center to amplify the work. 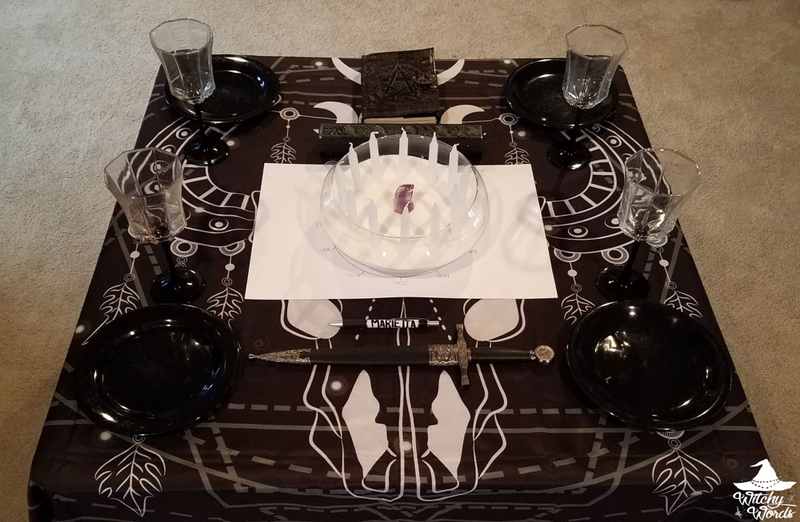 Because I was able to prepare this time, I could set up the altar in a more accessible way. This included my athame, a pen, wine glasses, plates, an incense holder, and a journal if I needed it. Off to the side, I added rolls, a bottle of cabernet sauvignon, and a loaf of rye. 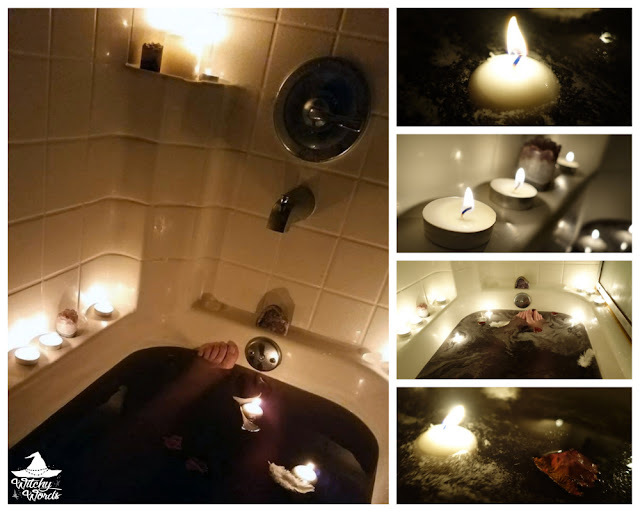 Once the ritual room was prepared, I took a cleansing bath. You can read more about that here. I was then ready to work! Ritual began with incense lighting and circle casting with my athame. I began in the west, the direction of the veil, and called quarters in a clockwise fashion. 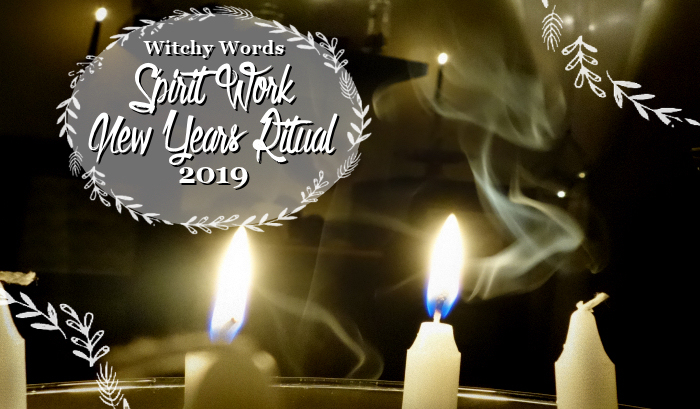 I then dropped to my knees in front of the west corner and beckoned spirits with good intentions to help me plan my year. And so the first candle was lit, starting at the top with January. For each month, I would watch the incense, scry through the flame and attempt to make sense of what the spirits around me were whispering. I would then endlessly write on the blank part of the paper beside the candles. Once I reached the end of a month, I lit the next month's candle and began again. However, as I progressed, things just weren't working. It was eerily quiet. I heard nothing, sensed nothing. Eventually, my pen broke. It was at that point that I realized something was off. I shut the ritual down, took a deep breath, grounded, and tried again. 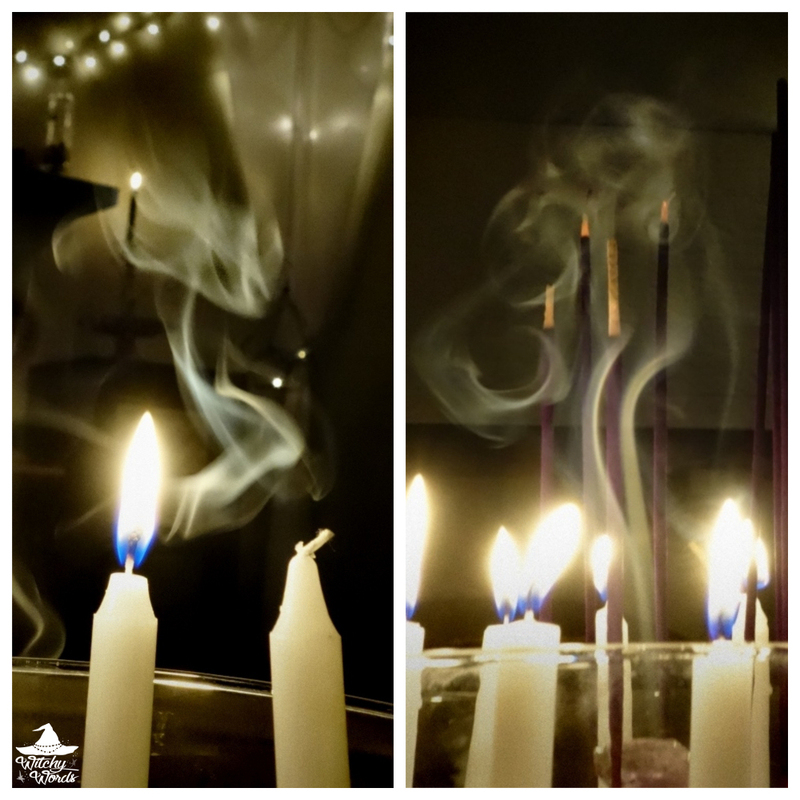 This time, I added incense inside the candles. I thought this might make them more sensitive to spirits in the area. I also made sure to greet my spirits and guides that I typically work with ahead of time, giving them their offerings up front. The entities showed themselves through the incense and the signs were clearer than ever, making it easy for me to interpret. Sometimes, you just have to stop, regroup, and try again! Any time you work with any entity, you should provide some sort of offering of gratitude. They've given you something. What do you give in return? I began with a smooth cabernet sauvignon, poured in all four glasses around the altar. This had also been offered to the entities and spirits I work with prior to this. I then placed four rolls at each corner. The rye was used, again, for entities that I work with regularly. As the candles burned down, I utilized the wax patterns and the order in which the candles died to determine other aspects of the year. 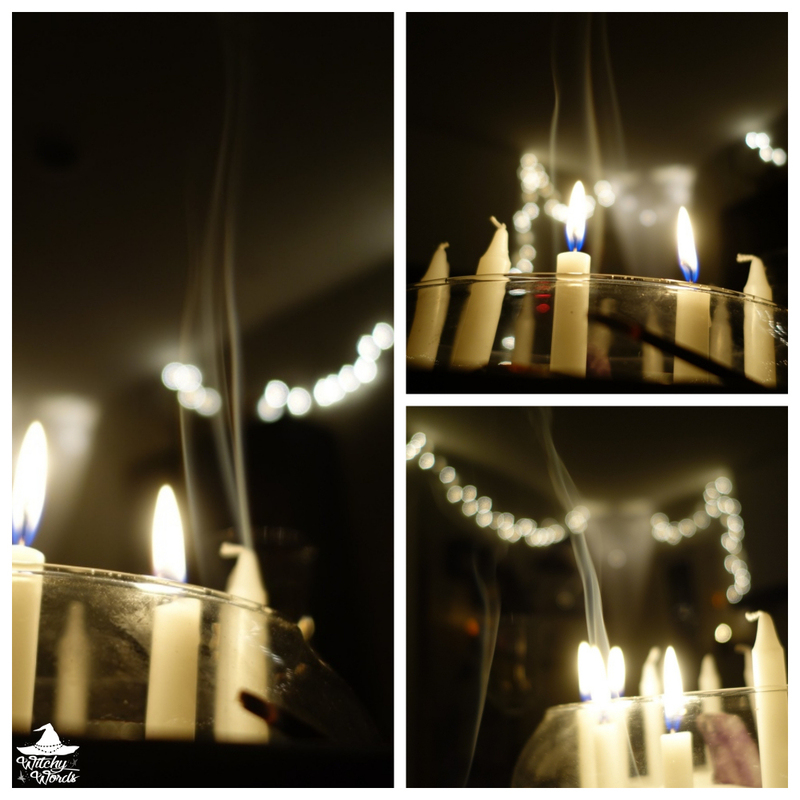 I also looked at the order in which the candles burned out to determine certain factors as well. At the very end, I lit a bayberry candle. Known to bring good luck throughout the year, I left it burning long after the circle was closed. ... and created a third sheet where I could see everything laid out before me. I could now officially break down my goals. 1. Until October at least, I want to keep my practice solo. I have been a part of a coven of some sort for nearly seven years straight. Practicing on my own feels foreign and clunky now. I need to get out of that rut this year, which will require some serious dedication to my craft. 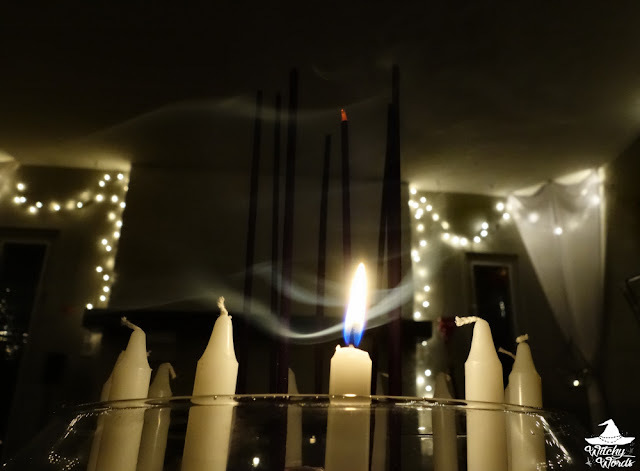 Rituals often exhaust me if I'm prepping them just for myself - hell, they exhausted me prepping them for the circle but I found a certain joy in that. It's time I found joy in personal rituals, too. I have a few set dates picked out that I need to adhere to if I want to truly experience my practice in its purest form. 2. I need to let go. Last year, I sought out a therapist. I've been going weekly ever since. I was fortunate that my first appointment occurred right after the disintegration of my circle, though I didn't talk about it at all until later on. This year, I need to focus on letting go in therapy. Letting go of what I pictured for my life, what I think I need to feel successful or complete, letting go of people who do not have my best interests in mind, etc. Therapy is going to be a key component in that. 3. My work can be streamlined. This requires that I overhaul how I manage my profit/loss sheet and taxes, especially since I've been doing both by hand. I already signed up for Quickbooks on the first and have plans to make digital copies of my receipts to combat being buried in them later. If I've done it correctly, I'll be hiring a tax professional in 2020 for 2019 taxes and won't have to worry about doing them by myself anymore. I need to make a sling for minute sketches, as well as a waist-strap for slipcovers on those. I need to get a new printer for digital caricatures. I want to get a stamp for my signature so it's legible, as well as a second stamp for the paper that I use under my personal DBA. I need new "Sorry! I'm the last one!" signs and I think I'm going to have them professionally made rather than just laminating cardstock. I want to get a marker board and have a checklist of things I need for each gig transposed onto it permanently to help combat cognitive issues I'm having on some of my meds. That's probably not everything I want to do regarding my job, but it's a good start. 4. Areas of the house need some organization. Last year, I tidied the garage and removed an entire box truck of junk and donations. Unfortunately, when we had our sewer line replaced, they had to go through the garage and destroyed all of my organization. 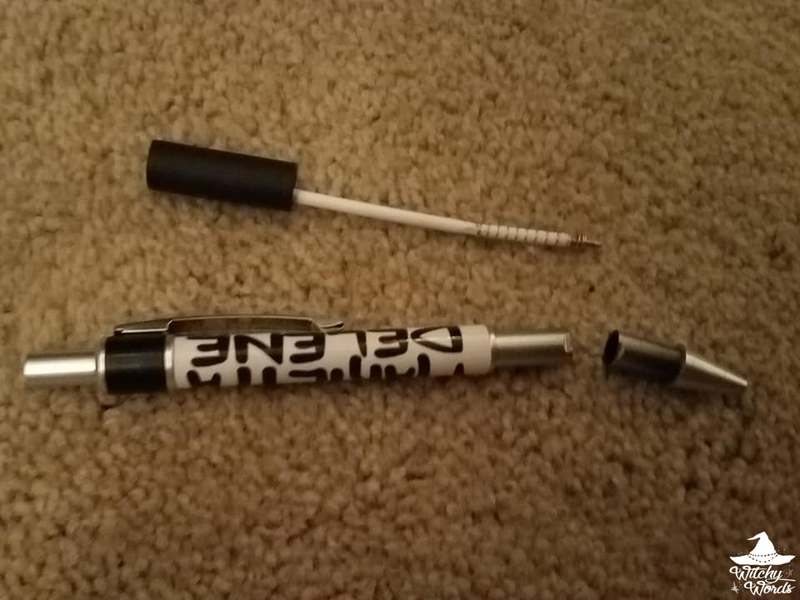 I was so frustrated by it that I haven't bothered to get it back together. This year, I need to do just that. I also need to sort the theater closet, the closet under the stairs, the kitchen cabinets, the laundry closet, the space under our bed, and the back bathroom cabinets. Instead of making a marked renovation on the house like I have most years, I think this needs to be my focus this year. 5. Financially, we're officially stable! I would love to add to our savings this year. We're actually doing very well for once. This year, I'd like to increase our savings by 25%. This should be pretty easy to do since I more than doubled our savings last year, given that nothing big smacks us in the face. 6. I need to work on my health, but I'm going to take it slow. Instead of mapping out a set goal I have to hit every month, I'm just going to try to wing it this year and see what happens. I want to take the pressure off of my health and see if it evolves naturally for once. 7. Aaron and I are going to eat at home more. No, really. Going through eight moves in eight years, three of which was in one year, we got used to eating out. Last year, I was supposed to ensure we ate in more and I didn't necessarily succeed at that. This year, I'm cracking down. I have autoimmunity, I'm lactose intolerant and, for the first time in my life, my blood pressure was high when I went to the doctor. No. Nope. Time to fix this. The following is a transcript of my year from what the spirits whispered at me, showed me through flame and symbolized through shapes in the incense. Some of it is very vague. Some of it is not. Enjoy. QUARTER ONE: Find your strength in your practice and be rewarded with the experience you so crave. January starts with a new moon on the fifth. New moons signify new beginnings, and that's exactly what this year could be. I'll face two paths this month - one that's steady and easy and another that's more challenging but will lead to the spiritual advancement I desire. Certain illusions will be shattered, and I will need to cut my losses to move forward. On the 20th, we'll have a super full moon eclipse between 9:35 PM and 2:50 AM EST. This is a particularly powerful night that will lead to some much-needed clarity. Axiom: Cut your losses and pick the path you need. This month, I find my creative power and generate new ideas in what is typically a slow and stagnant month. Something will occur that will necessitate that I take a stand and be assertive. Not doing so could have ramifications later. During this month, I will also have a borderline-religious experience of consolation and purity, and I need to pay attention to it. Axiom: The fire burns bright. Pay close attention to the light. This month will be affected by outside influences of my own making. If I can see those ties, I can use them like puppet strings to swing them in my favor. If I failed in February to assert myself, I could see some repressed anger boil to the surface in unintended ways. Much of this month will be spent in Mercury Retrograde, and I must remember all that comes with that. There will be a particular crossing of paths to note, but I must leave it. This is not a path I want to take. Axiom: Do not fall into the same traps as before or be burned again. QUARTER TWO: A time of service and dedication to your practice despite the work that lies ahead. April strongly relies on February and the decisions I've made that month. It will be incredibly busy between work and the upcoming vow renewal, and I will have to make many decisions that will not only affect May but the rest of the year. Three planets enter their retrograde phase this month: Jupiter, Pluto, and Saturn. Jupiter Retrograde encourages us to take careful evaluation and avoid risks. It's also a great time to pick up an old project or complete something you've been putting off. Pluto Retrograde is all about exploring our shadow selves and warding off negative energy. It's particularly spiritual but requires protection and caution. Finally, Saturn Retrograde asks us to rethink our career paths and check in with our links to our fathers. A lot of work to be done in such a busy month! Axiom: Busy bees get no rest and are also put to the test. Not much was said about the vow renewal itself, but our trip afterward will be a much-needed release. A failed endeavor may cause me to dwell on the past but I must let go in order to move forward. May is always incredibly busy for work. Between the vow renewal, trip, and my career, this month will fly by in the blink of an eye. Axiom: You dropped the baggage. Don't pick it back up. Something new happens this month that's very important to note. Because of this new important thing, I need to streamline my workflow so I can focus on other issues. During the middle of the month, resources may seem tight. This may not refer to money but more likely my own personal energy and time. Axiom: Changes are coming and preparation is needed. QUARTER THREE: Have confidence in your achievements but remember your morals. This month will feature yet another Mercury Retrograde from July 7th to August 1st. During this time, two paths will cross again but, this time, they will come together in the right way. At the end of the month, I feel blessed and cleansed, ready to begin anew. This is emphasized by a new moon both starting the month on the second and ending it on the 31st. Axiom: New beginnings are coming and the weight is lifted. There is a certain freedom in strength, and I can feel it this month. August is full of harmony with a dash of luck as everything begins to fall into place. Jupiter Retrograde ends on the 11th, but it replaced by Mars Retrograde, encouraging patience, courage, and peace. Axiom: Stand tall, stand strong, move forward. I'll need to focus on my nurturing, caring, and loving aspects in September, not just towards others but also myself. This month flies by quickly. It's normal to feel a little paranoid towards the Fall Equinox, but it's important that I just lie low to avoid running dry. Axiom: Pedal to the metal, dear. QUARTER FOUR: You've finally found your place. I often opt to be a loner but I may be required to step outside of my boundaries. My ability to keep my composure in new social situations is going to be a key strength of mine this month. At this point, I've been able to streamline most of my life but there's one area that will need work in October. It's important that I focus on it. Pluto Retrograde ends. Axiom: Make the connections you need to move forward. Now is the time. In November, it's important that I focus on my relationship with my husband, especially as we spend most of this month under Mercury Retrograde. A spirit will visit before Samhain and make a clear request. My ritual on November 7th - the scientific midpoint between the equinox and the solstice, and when I often celebrate Samhain - should be focused on the Man in Black. If done correctly, I will find my social circle the next day. Axiom: The pieces begin to fall into place. If followed correctly, December will mark an official release from the weight of 2018. It will take hard work to reach this point, but it brings significant happiness and satisfaction. Axiom: This was an important mark of growth. Take it as that. Sounds like an eventful year! My guides mentioned that those of us that work with spirits are going to notice a shift in the veil and an increase in spirit activity. I too am expecting a visit, but mine is supposed to come around Midsummer. I'm excited to see what this year brings for us all. Sounds like you have an eventful year ahead of you! I’m looking forward to hearing more about it. I’m catching up again on comments since mine were eaten by cyberspace gremlins the first time around (I was the one who checked with you on Facebook messenger) so I’ll leave a more detailed comment later. Good luck!